One of the best tools you can have in your home gym is a set of resistance bands. They’re cheap, take up hardly any space, and can be used for excellent, full-body workouts. If you’re interested in getting the most out of your workouts, try this full-body cardio workout. 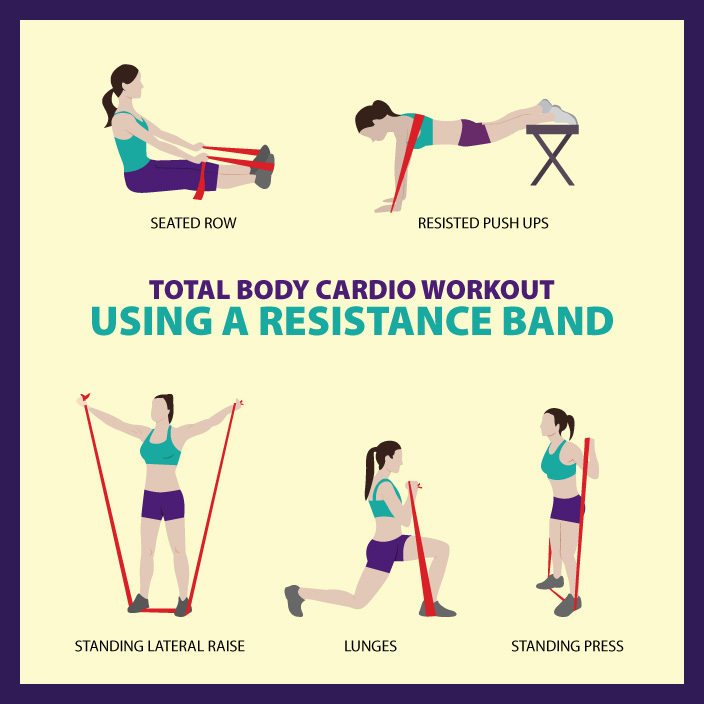 All you need is resistance bands. This is a circuit workout and you’ll be doing each exercise for 60 seconds. After each exercise, rest for 30 seconds (or less to increase intensity) then move on to the next one. When you’re done, repeat the whole thing two more times. Remember to hydrate and stretch before you begin. Get into push up position with a resistance band across your back, and one end pinned under each of your hands. Do as many pushups as you can within 60 seconds. Stand with your feet shoulder width apart, with the center of the resistance band underneath them. Hold one end of the band in each hand, with your palms facing inward. Lift your arms out and up to either side of your body until they are parallel to the ground, then return to the start position. Repeat as many times as possible in 60 seconds. Begin by taking a large step forward with your right foot, and placing the center of the resistance band under it. Hold the ends of the band in each hand just under your chin, and then lower yourself into a stationary lunge. Return to the top position, then repeat as many times as possible in 60 seconds, before switching to the other side. Stand on the center of a resistance band with your feet shoulder width apart, holding the ends in each hand with your palms facing forward at shoulder level. Press your hands straight up over your shoulders, then bring them back down to shoulder level. Repeat as many times as you can in 60 seconds. Sit down on a mat or on the floor with your legs straight out in front of you, back straight. Loop a resistance band around your feet and hold the ends in each hand. Draw your elbows back toward your body, pulling the bands in, then gently extend back out.